When I joined HMRC back in June 1999, travelling to the other side of the world for work wasn’t something I’d imagined ever doing. So when the chance came to visit the Caribbean island of Montserrat to help build a digital tax system I was more than happy to accept. I’m Mick Hepple and my team in HMRC creates and implements intelligent software solutions for tax systems. This is the story of how we are helping Montserrat. Together with a colleague, Paul Melody, I first visited the island in December 2016. Our mission was to help the Montserrat Customs and Revenue Services (MCRS) digitise their tax collection processes. On arrival we met Head of the MCRS, Peter White, who made us feel very welcome. Peter explained how they operated and how they wanted to make sure any new system was created around their customers’ needs. 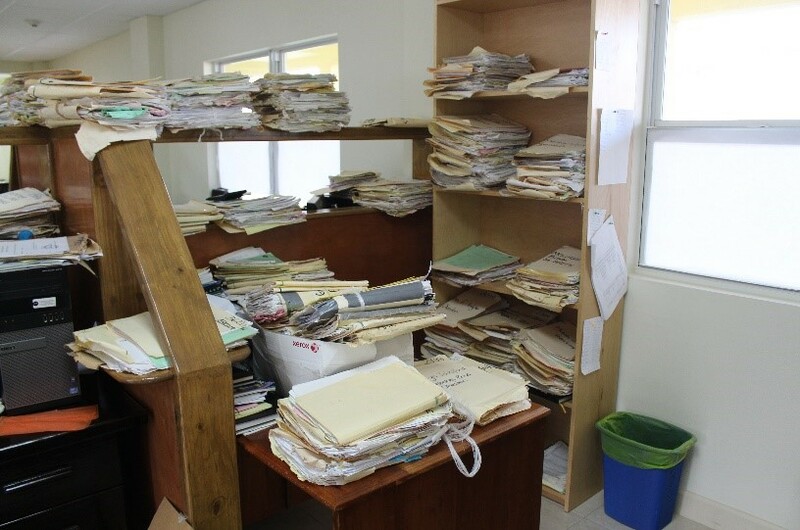 What struck us most was the sheer amount of paper and age of the paper files. It felt a bit like going back in time 30 years. Given the small size of the island they have mainly face-to-face visits. However, finding the customer’s file in a mass of paper scattered around workstations and store rooms is a significant challenge and leads to lengthy delays for the customers. It was already becoming clear how the effects of a devastating event 20 years ago were still being felt today. Montserrat is one of 14 British Overseas Territories under the jurisdiction and sovereignty of the United Kingdom. Back in 1997 the island suffered a massive tragedy when its Soufrière Hills volcano erupted destroying the infrastructure of the South side of the Island including the capital Plymouth and the main government buildings. 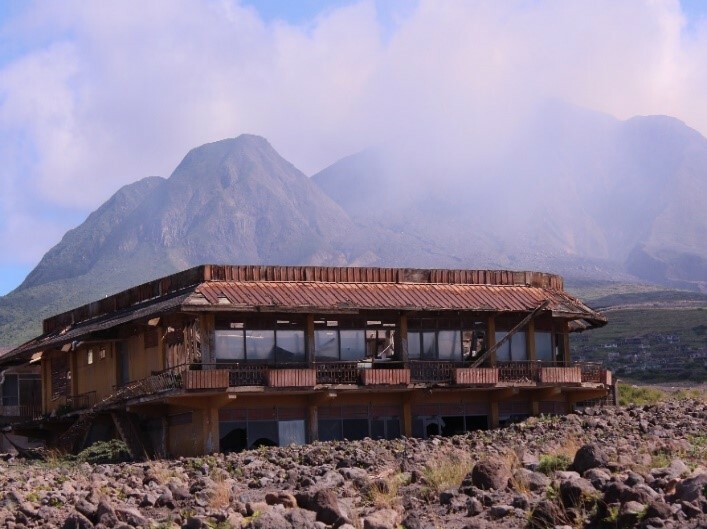 The devastation that followed the eruption meant an exclusion zone was created and the capital and the government services were relocated to the North side of the island, which was far less developed. The population at the time of the eruption was just under 13,000. The Department for International Development (DFID) played a major role in the relocation exercise and have continued to work with the Montserrat Government since that devastating day. Many of the residents left Montserrat, resulting in a much smaller population of around 5,000 today. Meeting with Peter, we felt confident from the outset that we could help provide a better solution! Each day we met with Peter’s team, gathering their requirements and working on their digital solutions. It was certainly no holiday, and was often pitch black by the time we left the office at night. During the weekend we did manage to visit the volcanic exclusion zone where the borders are patrolled by the military to keep everyone out but more importantly to keep people safe as Soufrière Hills volcano is still active. It was both amazing and frightening to see. It put the whole trip into perspective for us. After our initial visit I returned to Montserrat in July 2017 with software developer Ian Barnes to give an update on progress and, together with MCRS staff, ensure everything was on track to deliver the new digital solution. It was really well received. 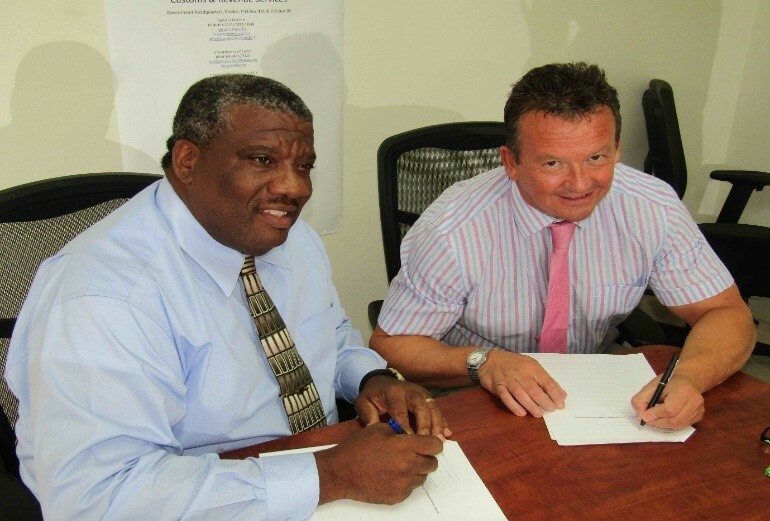 Also during the visit, Peter White and I signed a Memorandum of Understanding (MoU) to further our joint working with the Island’s government. We have one final visit planned for December 2017 to perform system testing, train the staff, and formalise the support process. The aim is for the system to be live ready for the processing of Montserrat Individual and Business Tax Returns for 2017. If (when) all goes to plan, the project will have been delivered in just over 12 months from the requirements gathering to the deployment of the digital system. I feel privileged to have had the opportunity to work on such an interesting project, and one which will make a real difference to the people of Montserrat. It’s a small positive legacy to leave after such a huge and devastating natural disaster but it’s one to feel proud of.